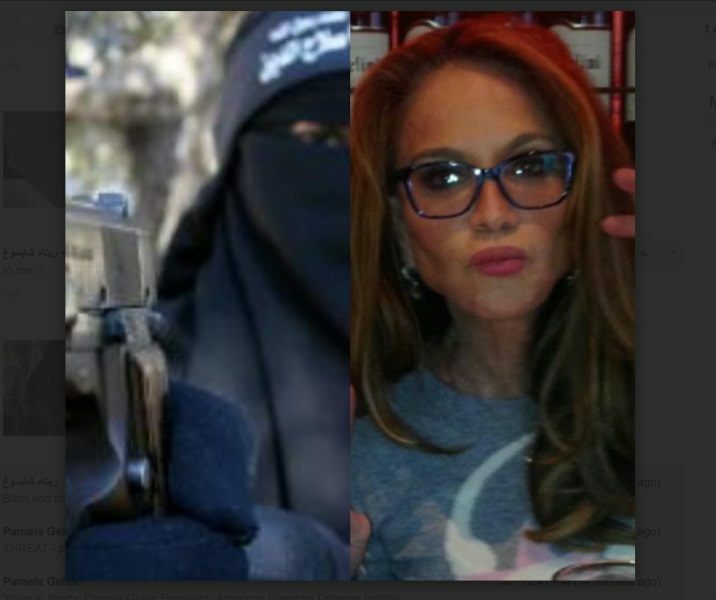 Pamela Geller, the prominent activist for the Counter-Jihad movement, known for her opposition to the proposed construction of the Islamic Community Center and mosque near the former site of the World Trade Center and sponsor of the, “Draw the Prophet” cartoon contest is suing Facebook. According to Breitbart Every day I received emails from readers and members of my various Facebook groups, asking for help after having been blocked for posting a story or comment that might offend Muslims. This is America, not Saudi Arabia. Enough. The American Freedom Law Center (AFLC) is filing a federal lawsuit today in the U.S. District Court for the District of Columbia, challenging Section 230 of the Communications Decency Act (CDA) under the First Amendment. In a press release, he AFLC explained that “Section 230 provides immunity from lawsuits to Facebook, Twitter, and YouTube, thereby permitting these social media giants to engage in government-sanctioned censorship and discriminatory business practices free from legal challenge.” The lawsuit was brought on behalf of the American Freedom Defense Initiative (AFDI), Pamela Geller, Robert Spencer, and Jihad Watch. For years I have documented the outrageous bias of Facebook’s speech policies. Notoriously one-sided, those who oppose jihad terror, support Israel and stand against the most brutal and extreme ideology on the face of the earth (sharia) have been systematically blocked and banned. Just last month Facebook took down my page and blocked me after a devout Muslim opened fire on a gay nightclub in Orlando, Florida. Facebook said they took down my page because of their rule against “hateful, obscene, or threatening” content. But it is not hateful, obscene, or threatening to oppose jihad terror such as we saw in Orlando. Truth is not hateful or obscene. What is hateful, obscene and threatening is that Facebook is moving to silence everyone who speaks honestly about the motivating ideology behind such attacks. After the Orlando jihad massacre, they went into full damage control mode. Orlando showed jihad for what it is. They’re committed to obscuring that knowledge and making sure people remain ignorant and complacent about the nature and magnitude of the jihad threat. They also banned my own account for thirty days. This has happened before — when I get too close to truths they want to cover up. They’re afraid these truths will get out, and that people will start acting to remove the feckless and traitorous leaders who got us into this fix. And to those of you who say, “Forget Facebook, we’ll do without it,” I say no. I am sick and tired of the suppression of our speech. We are unable to engage in the public square. And yes, Facebook is the public square; it’s where we connect. We have to fight for it. Shouting into the wilderness is not freedom of speech. My Facebook page has close to 300,000 followers, and combined with my pages (SIOA, SION, AFDI), the reach is another 100,000. It’s a critical connection. Facebook workers routinely suppressed news stories of interest to conservative readers from the social network’s influential “trending” news section, according to a former journalist who worked on the project… Several former Facebook “news curators,” as they were known internally, also told Gizmodo that they were instructed to artificially “inject” selected stories into the trending news module, even if they weren’t popular enough to warrant inclusion—or in some cases weren’t trending at all. “News curators”: what a Goebbels-like term. Those of us who connect on Facebook have known this for years. We see it. We feel it. Which is why it is critical for our Facebook followers to share our stories on their news feeds. It is up to us to educate people. Facebook’s unlawful, discriminatory practices have been mandated at the highest levels. In September 2015, German Chancellor Angela Merkel strong-armed Mark Zuckerberg of Facebook to censor posts critical of the migrant invasion. CNBC reported that Merkel was “overheard confronting Facebook CEO Mark Zuckerberg over incendiary posts on the social network.” What kind of incendiary posts? Pro-jihad terror posts? No: Merkel was angry about posts criticizing her policy of inundating Germany with Muslim migrants. This is so typical of the elites. They control policy, they control the media, they control the culture — but they can’t control the people. And this makes them crazy. If they could, they would change the people. And so they try to change the people by restricting their access to information. 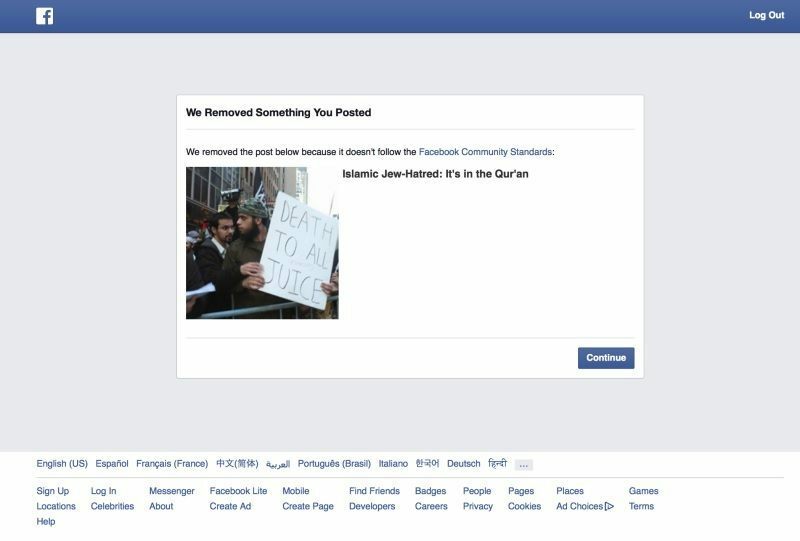 My page “Islamic Jew-Hatred: It’s In the Quran” was taken down from Facebook because it was “hate speech.” Hate speech? Really? The page ran the actual Quranic texts and teachings that called for hatred and incitement of violence against the Jews. So who exactly was responsible for any “hate speech” that may have been present on the page? When they took down the page, photos of Muslims such as this one were removed. This is an actual photo of a Muslim holding a sign saying “Death to the Juice” at an anti-Israel rally in New York City. The photo was taken my esteemed colleague Pamela Hall. It is news. Facebook policy dictates that truth is hate speech. Despite its content being simply factual, the page was taken down. Up only two weeks, it had 10,000 followers. Of course, I started a new page, “Islamic Antisemitism: It’s in the Quran” — like it here. But I suspect that this page won’t live long on Facebook, either. Why is Zuckerberg scrubbing evidence of Muslims inciting people to commit acts of hatred and violence? 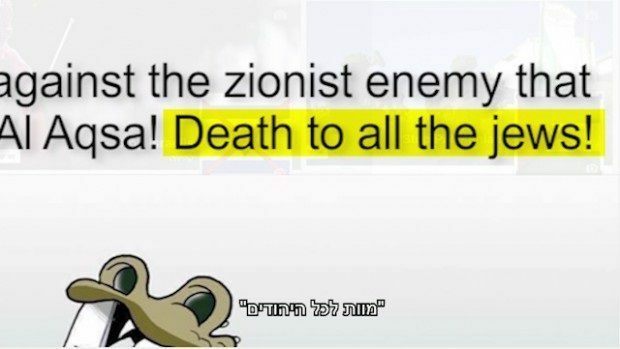 Why do his policies allow for vicious posts and pages against Israel to stand, but exposing the truth behind that Islamic hate is prohibited? That’s sharia. Dexter Van Zile, the Christian Media Analyst for the Committee for Accuracy in Middle East Reporting (CAMERA) writes: “Recently, my correspondents have alerted me to another page on Facebook. The end of the URL includes the phrase ‘The Truth About Jews” and the page itself promotes Blood Libels against the Jewish people. It’s titled ‘Jewish ritual murder.’ The page has all the stuff you’d expect on an anti-Semitic Facebook page. 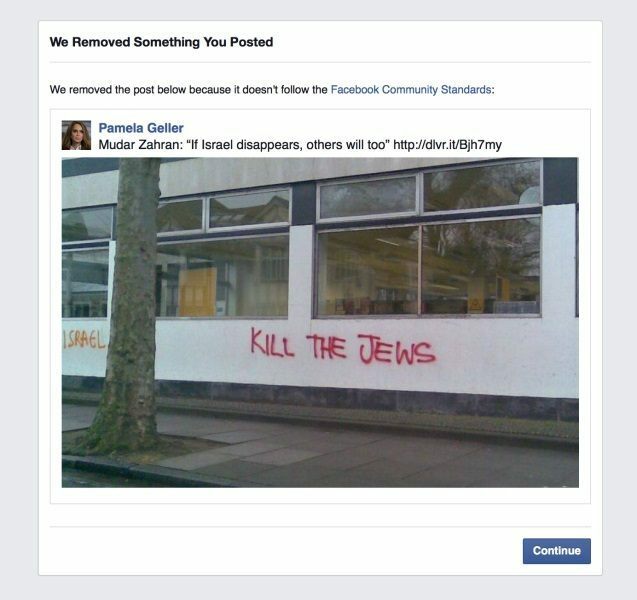 It has 248 ‘Likes’ and includes anti-Jewish libels from all over the world. The page includes a disclaimer that is simply bizarre: ‘Comments that are offensive, obscene, vulgar, irrelevant to this page or classified as spam will be removed.’ The entire page is offensive and obscene. 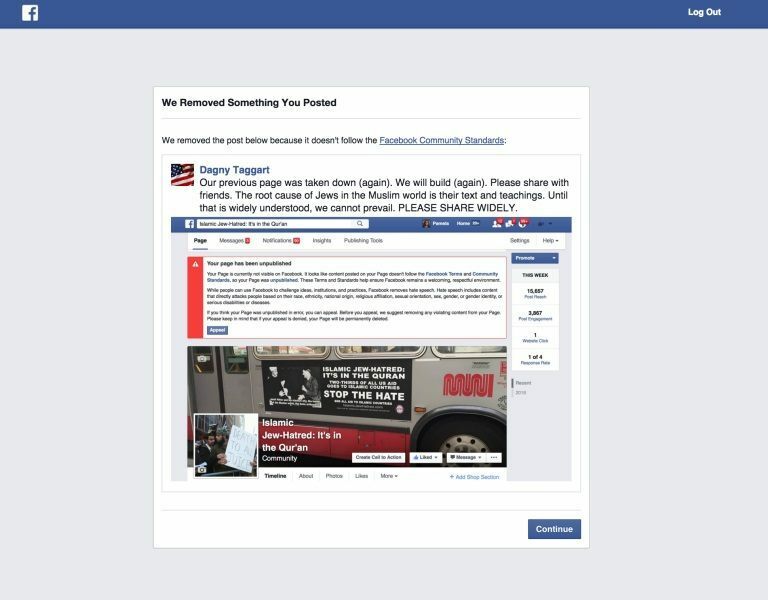 And the page, which has been in existence since March 2012, is an exercise in vulgar anti-Semitism. “Yes, people have complained about the page. 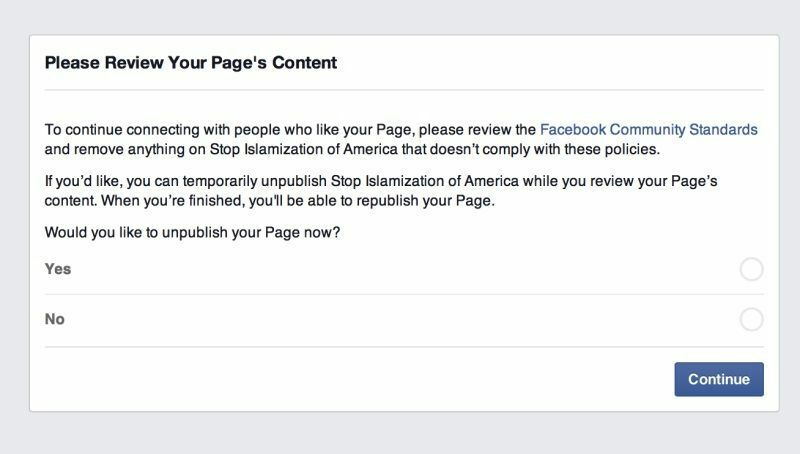 And yes, Facebook has responded with messages indicating that the page does not violate the company’s community standards. Then they reported both groups to Facebook. The pro-Israel group was taken down. The pro-Palestinian group wasn’t. Facebook is increasingly doing the bidding of vicious Muslim thugs and supremacists. I receive a number of emails weekly from Muslims living in Muslim countries who have left Islam and live in terror and fear of being found out. They plead for help and advice. One group of Arab ex-Muslims, after having their material repeatedly deleted by Facebook, prepared a petition at Change.org asking Facebook to stop deleting Arab Atheist and secularist groups. Sign this petition. Frankly, it’s terrible and getting worse. As it continues to seize power and control, the left is on dangerous ground. We well know the bloody outcome of this trajectory. This has to end now.